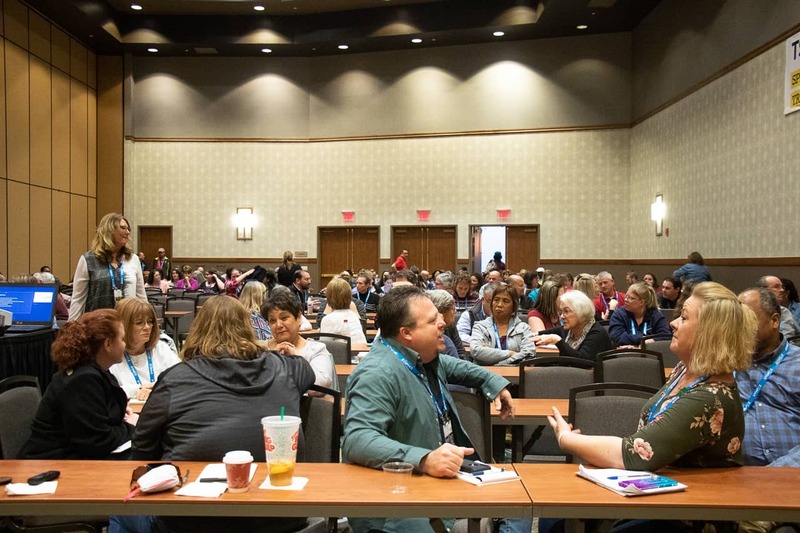 FRISCO, Texas — “If you don’t have the personality for your route, you have no business driving it,” said Dayle Cantrall, program administrator in special education for San Juan Unified School District in California, during a workshop at the TSD Conference. Several workshops this week focused on transporting students when they may be too unsafe to transport, and the impact the bus driver can have on these students. Cantrall’s workshop on Sunday, “Knowing Who You Transport,” focused on bus drivers understanding their kids on a special needs bus. Drivers must be able to identify the different disabilities, and well as what they should be aware of prior to transporting. Cantrall stressed that bus drivers could be the first adult to see these children in the morning, and that developing a positive relationship with the students is an important step. The workshop discussed transporting students with different disabilities and how bus drivers need a thick skin to respond to child behaviors. Drivers need the ability to let incidents and words roll off their shoulders. Cantrall said that being able to start each new day fresh without carryover from the previous day is important as well working with the students, building expectations and creating rules on the school bus. Cantrall discussed transporting students with select disabilities and what the drivers should expect. For example, when transporting students with intellectual disabilities, bus drivers need to be able to tolerate loud noises and understand that students may need to hold an object to help calm them down. Some of these students are subjected to a specific routine, and bus drivers should be communicating with the students if there is any change on the route, such as another student not riding. Cantrall said it is the bus driver’s job to know the conditions of the students they transport. If they don’t know, they need to ask. Someone in that school district special education department knows the details of the child’s condition, but is not properly sharing the information. Some students are nonverbal and use alternative ways to express communication. Susan Shutrump, supervisor of OT/PT for Trumbull County Educational Services Center in Ohio, gave a presentation on students who have sensory deficits. She detailed what the bus driver and administrators can do to make sure they are transporting those children safely. Shutrump started her workshop on Tuesday, “Sensory or Behavior? Getting to the Root of Unsafe School Bus Rides,” by handing out sensory objects to people in the audience. A flashing light at the front of the room was passed throughout the room, because it proved to be too distracting to the attendees while Shutrump presented. Attendees tried to hide the light or set it to stop the flashing. Some attendees also sat on sand paper or inserted ear plugs during the presentation. One audience member said the sandpaper was affecting her concentration. Shutrump said these are the conditions that some students deal with, daily. 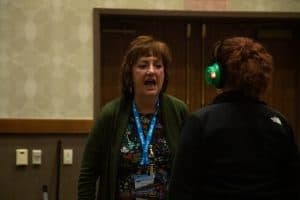 Trainer Sue Shutrump provided an example of how a child who could have a hearing deficit might respond, or not, to the driver or attendant on the school bus, during her workshop on March 19, 2019. A volunteer wore headphones amid background noise and attempted to communicate with Shutrump. She was unable to hear what Shutrump was asking her to do. In another session, Heather Hirsch discussed a similar situation in her keynote presentation, ”Student Bullying: How can we Respond,” on Monday. There are obvious behavioral traits that can be observed, but there is always something happening behind the scenes that not everyone knows about. Shutrump divided her workshop into three sensory traits that special needs children may have difficulties with. She discussed touch, sound and sight, plus the different behaviors that students will show if they have these sensitivities. Shutrump described the strategies that bus drivers can use when boarding students, where to sit them, how to maintain good behavior on the bus and what to do when faced with an evacuation situation. 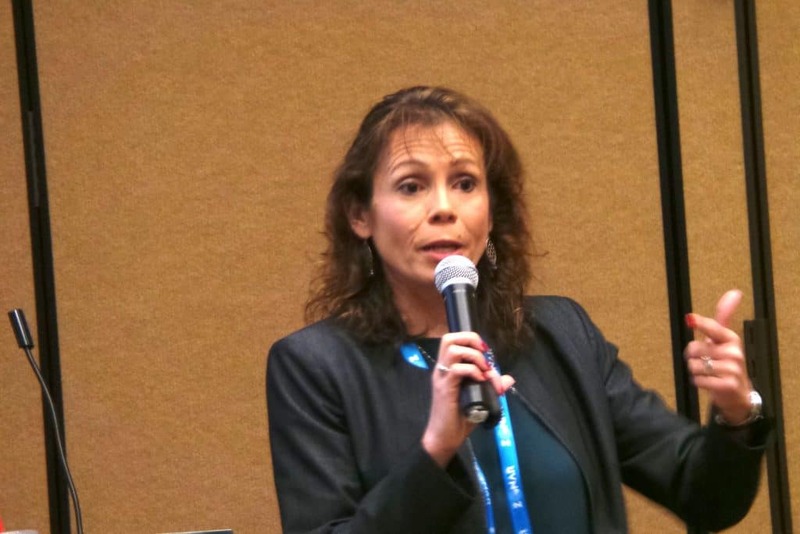 Launi Harden, director of transportation for Washington County School District in Utah, discussed selected situations from attendees who are currently experiencing them. She encouraged audience members during her workshop on Tuesday, “What Do You Do When a Student is Too Unsafe to Transport,” to suggest how to solve some of these difficulties. 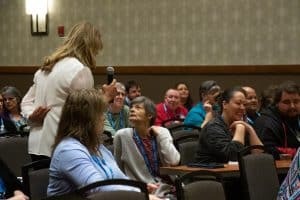 Launi Harden, director of transportation for Washington Country School District in Utah, encouraged open dialogue during her workshop on students who are too unsafe to transport. One audience member discussed transporting a student who is violent, by swinging his arms and hitting anyone who gets in his way. Many attendees stood up and gave suggestions on how to transport this student and get him to school safely. Suggestions included identifying the student’s emotional trigger, holding new Individualized Education Program meetings with all involved personnel, and even using alternative transportation, instead of the school bus.